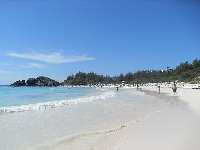 Bermuda is a land of pink sandy beaches, clear turquoise seas and picturesque old colonial towns. Britain's oldest colony was once known to fearful sailors as Devil's Island, its shallow waters and coral reefs claiming many shipwrecks. Today, these reefs and wrecks provide a wonderful playground for swimming, snorkeling and diving. The archipelago of Bermuda lies 650 miles (1,046km) off the east coast of America in the Atlantic Ocean, forming one corner of the legendary Bermuda Triangle. The seven main islands are linked by causeways and bridges, and stretch just 20 miles (32km) from tip to tail. The majority of American visitors think of Bermuda fondly as being English in character. British visitors, by contrast, seem to feel that it has a strongly American flavour. The reality is somewhere in between. Bermuda has a unique culture that draws influence from both British and American traditions. Business attire on the island might constitute a jacket and tie with Bermuda shorts, while bikinis are banned further than 25 feet (7.6m) away from the water! Not just a coveted holiday destination, Bermuda has become a centre of high finance thanks largely to generous tax advantages and advanced satellite communications. Major corporations have flocked to set up shop on the island, helping the country become one of the richest, per capita, in the world. With its stunning natural beauty and close proximity to Florida, Bermuda has become a popular destination for cruise ships and yachts, with over 200,000 people visiting the islands from cruise ships every year.